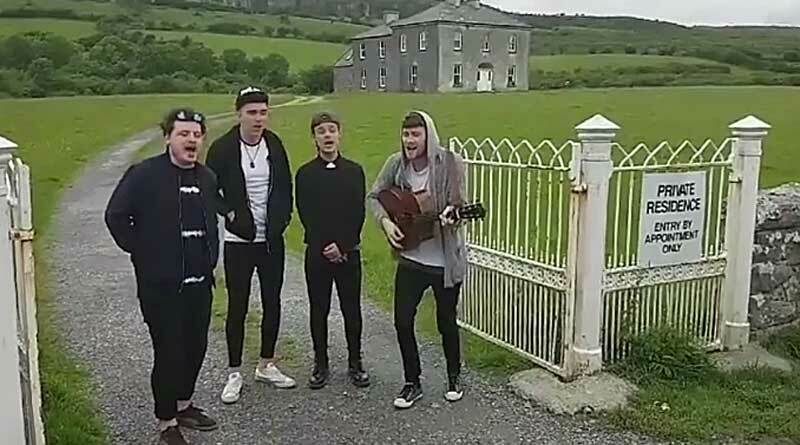 Irish band Fallen Lights have performed an informal cover version of the classic song My Lovely Horse, joking that the video is their Eurovision audition tape for 2018. Their video, which is just over a minute long, was uploaded to their Facebook page on June 10 and at the time of writing had been watched 115,000 times. My Lovely Horse originally featured in the 11th episode of the Father Ted sitcom, following Ireland’s run of wins in the Eurovision Song Contest in the 1990s. Father Ted became determined to enter and win the “Eurosong Contest” and My Lovely Horse was the result. They won the Irish Eurosong competition and took My Lovely Horse to the European final, where they bombed spectacularly. Now, Fallen Lights, made up of Graham Dowling, Andrew Cody, Jay Wiley and Joe Murray, have delivered their own take on the cult classic, recording the video outside the house in County Clare used for the filming of the series. Fallen Lights formed in 2014 and have enjoyed considerable success.